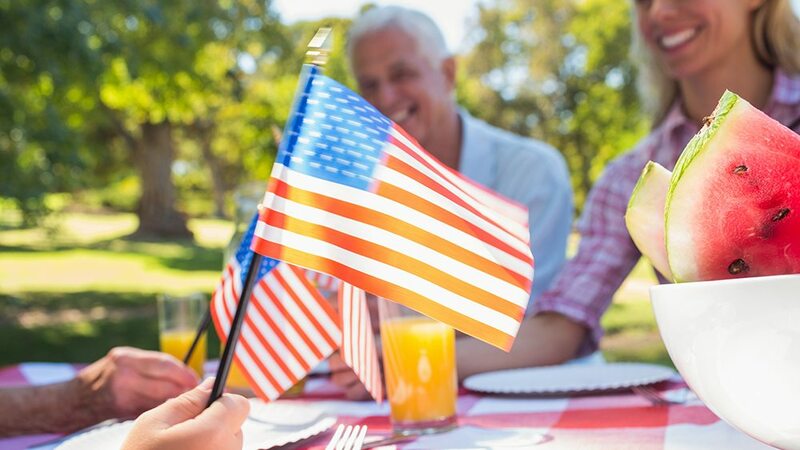 The biggest birthday bash in the country is coming up, and roughly ⅔ of the nation will attend — on July 4th, America is turning 241! This upcoming weekend has historically been the top in sales of 3 things: hot dogs, beer and fireworks; proving that no one throws a party like the good ole US of A. If you’re one of the many Americans whose celebration of freedom will include a backyard barbeque this year, here’s some food for thought. Chances are, you’ll be hosting more than just family and friends. No, we aren’t talking about your neighbor down the street who invites himself to every party! We’re talking about the peskiest type of uninvited guests — bugs. Cut the grass short and drain any standing water that could double as a mosquito breeding ground, such as bird baths, buckets & kiddie pools. Tall grass provides a shady haven for many types of insects, including ticks. Keeping your yard well-maintained will help reduce the number of creepy crawlies hanging out on your lawn. Mosquitoes lay their eggs in standing water, which hatch after only 24-48 hours. Draining standing water and replacing the water in decorative items, such as birdbaths, daily can help reduce the number of mosquitoes eyeing you for their next meal. If possible, serve food and drinks indoors. If yours is an outdoors-only event, use containers with lids or mesh covers. By leaving food outside uncovered, you are giving nearby insects a compelling reason to crash your party in force. If you serve your food inside the scent will carry less and be harder for them to detect. They will also be barred by screened doors or windows. If you would prefer to serve food outdoors, you can use containers with lids or purchase mesh covers that will prevent bugs from being able to chow down. Instead of decorating with flowers, which can attract stinging insects, try decorating with herbs such as rosemary and sage. Many insects do not like the smell of these herbs, so they act as a natural repellent. You could also throw a few sprigs on the grill while you cook to double as a seasoning! If you are set on floral decorations, certain types of flowers (such as chrysanthemums) have been known to deter bugs. Keep garbage and empty drink bottles in a bin (with a lid) away from guests to help keep yellow jackets and flies from buzzing around. One man’s trash is a yellow jacket’s treasure! Yellow jackets love garbage, particularly tossed out meats and sugary substances. If you don’t have a lid on your garbage bin, you are essentially inviting them to come on over and dig in. It’s important to keep in mind that yellow jackets don’t exclusively seek out empty soda cans – if you leave a full soda sitting around, be careful when you take your next sip! Provide your guests with a shared bottle of bug repellent to prevent them from becoming mosquito magnets. There are many different types of insect repellent, from natural DIY recipes to drugstore sprays that contain DEET. Whichever your preference, consider supplying a bottle for your guests to use as an added measure of protection against biting and stinging insects. And don’t forget to read and follow the product labeling regarding the application of the repellent, so you can be sure you are using it safely. Create a few DIY wasp traps and place them around the perimeter of your yard (a safe distance from guests). There are many types of do-it-yourself trap tutorials floating around on the internet that are simple to make. One thing to keep in mind is that you should never use honey for your bait, as it will attract honeybees. If you find yourself waging war against bugs, Modern Pest Services can help. Our HomeCare Green service provides year-round protection from 60 different types of pests with seasonal treatments designed to target New England’s unique pest concerns. Our highly trained team of professionals have the skills and knowledge it takes to tackle the issue – guaranteed! Troubled by ticks and mosquitoes in your yard? There’s still time to sign up for our summer Mosquito and Tick Control program! This program runs through September and includes monthly treatments to effectively and meaningfully reduce your mosquito and tick populations. Summer’s too short to let ticks and mosquitoes prevent you from enjoying your time outside! Ready to take the next step towards freedom from bugs? Give Modern Pest Services a call or request a FREE online quote today!